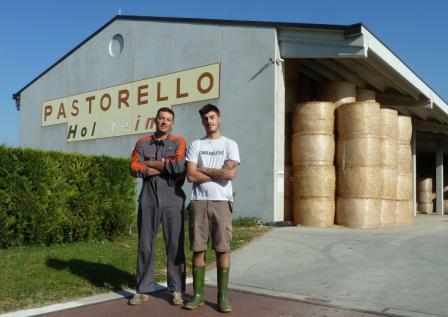 Testimonials | New Farms | Materassi autobloccanti per vacche da latte. We were among the first in Italy to get Blister installed about 9 years ago, therefore we can provide important proofs; not just sort of a short time. When someone comes to visit my barn I always say to watch the hocks and not to look at Blisters. I say to watch if the cows are lying down or not, and how do they get up. I go to many other barns and always find damaged hocks. Pay attention to the hocks of the animals and not to whom shows you how the system works. Here you can’t find a single cow that has ruined hocks. You don’t see any bruises, you don’t see any suffering cows and this is the most important thing. I can only say nice things about Blister. We have this area in the barn in which there are no Blister and unfortunately we have to divide the animals: we put the big cows on Blister, while the first calving heifers in normal cubicles. Otherwise, well, it’s a disaster for cows: they can’t get up! The traditional cubicle has holes.. no way! Cows go on Blisters because otherwise they can’t get up. In nine years we never put the sand into the mattress, ever. We did it at the beginning and then last month. It’s almost a week that we don’t redo the surface layer on the mattress, and therefore we’re putting straw on it today. There’s a cubicle for each cow and the animals lie down for at least 11 hours. They are well and quiet. To us Blister means comfort. 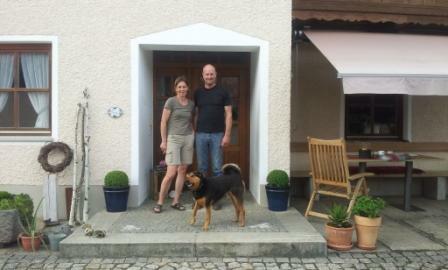 As we got the product installed in the barn we have solved many problems regarding any physical damages of the animals. We noticed the pleasure of the animals in staying longer inside the cubucles; and today, they remain at rest about 11 hours – and we have the pedometers that show that to us – which means about 1 hour and a half more than before. There are times during the day where you have no free cubicles. 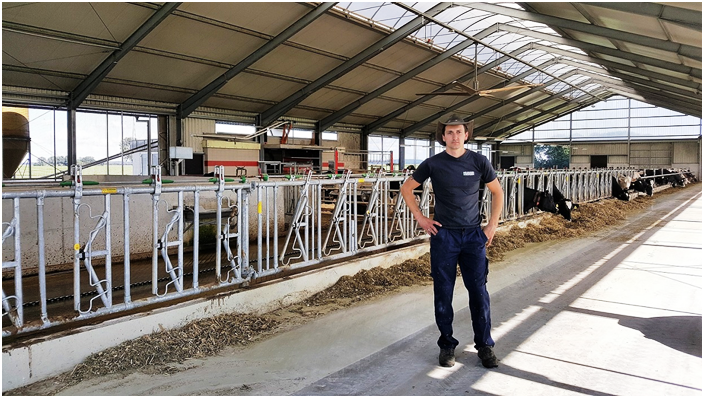 We are among the first farms in Bavaria to try Blister-Sandbettmatten system for our dairy cows and we are delighted. We’ve been using the Blister-Sandbettmatten for a year and a half for our German Red Spotted and Holstein cows with their great satisfaction and with a very good situation as regards furs and hocks. Thanks to the use of sand as bedding material, we are satisfied with resting time which is between 11 and 12 hours, which is perfect even in tough summers – here in Germany it has reached 35 degrees last year. The best proof of my satisfaction is the purchase of another 24 pieces of Blister-Sandbettmatten for the new additional building to the barn. Since we also have a biogas plant, for us it was important that the sand – like the clayish one we put into the cubicle – remained still there. For maintenance over the Blisters we use spelt hulls with excellent dryness. 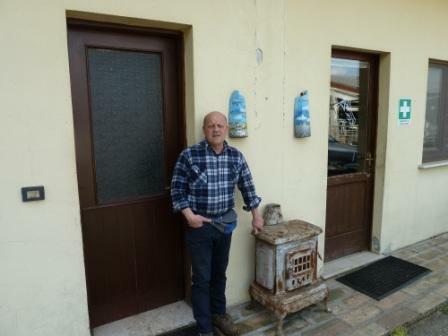 During a visit to Italy at the end of 2015 I had the chance to see the Blister installed in some Italian dairy farms, and I was impressed and enthusiastic with that. Afterwards I did a test with 7 pieces in my barn by getting them installed into a few deep cubicles and then covering them all with sawdust spread over the sand. My expectations were confirmed: the animals were clean and the cubicles easier to maintain. The positive results of course led me to make further investment in order to modernize the rest of the flock with 75 Blister in the remaining cubicles. An investment that has paid back on several occasions due to the increased animal welfare and a much easier management of the cubicles.